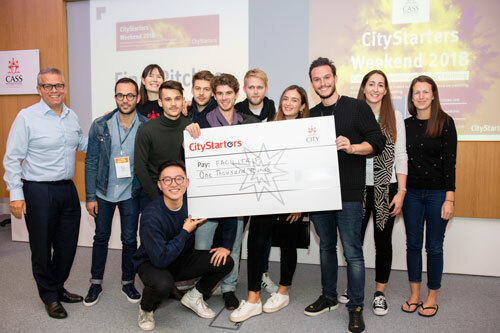 Over 100 students, 35 pitches, 15 finalists and three winners at this year’s City Starters Weekend. The three day student entrepreneurship competition calls on students to pitch their business ideas to experts for cash prize rewards. The audience and attendees were then invited to vote for their favourite 15 pitches, before the students formed teams where they turned their ideas into businesses. The Weekend was organised by Aurore Hochard, Head of Entrepreneurship, and students got to hear and receive coaching from business experts. 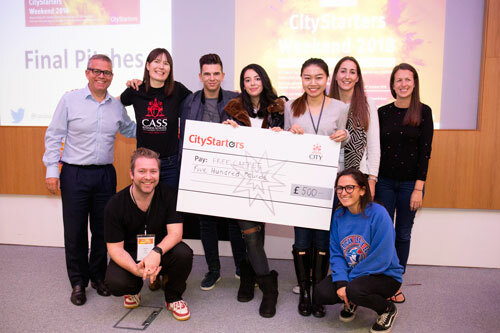 These included Christina Richardson, Senior Teaching Fellow at UCL and Entrepreneur; Emma Obanye, CEO of Mindful Team; Nina Ricafort, Marketing Manager; Dr Ruben van Werven, Lecturer in Entrepreneurship; previous City Starters Weekend winners, Lonbrella and more. This year saw an interest in sustainability, with the majority of students choosing to focus their ideas on reducing food waste, plastic consumption and fabric pollution. 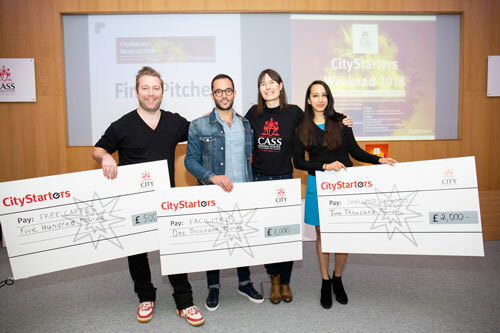 Three worthy winners were selected by the expert judging panel which included, Rebecca Sharp, Startup Incubator Manager, Elizabeth Broderick, Finance & Operations Associate Kindred Capital, and Professor Costas Andriopoulos, Professor of Management and Associate Dean for Entrepreneurship. In first place came third year student, Umadevi Dassaye (BSc, Actuarial Science), with her business Shellpod Shampoo. Umadevi’s creation of small balls which come in biodegradable packages allows users to run it under water in their hands to create a shampoo. In second place was Nathanel Borros, (MSc, Entrepreneurship), with his platform Facilitrip, software designed to help business people travel without the need to complete admin or expenses. Andrew Bott, (MSc, Entrepreneurship), finished in third place, with FreeCaffe.com, a business that provides market research for small businesses by giving free coffee to customers who answer research questions..
Umadevi said: “I don’t quite believe that I have won! It has been an amazing three days and I owe a lot to my team as I wouldn’t be here if it wasn’t for them. “I got the idea for Shellpod Shampoo when I was doing my laundry and I thought that I could make a shampoo version of the capsuled washing detergent. “I care about the environment and realised that very few people recycle their shampoo bottles, so these balls could help us eliminate plastic waste. The thing I will take away from this weekend is to be confident in myself and my product. The mentors helped me work on my pitching by showing me how to describe things in ways which everyone can understand. One of the finalists, Claudette Ferro (MSc, Health Management), whose business Alina Jewellery turns plastic straws into jewellery, reflected on her experience over the weekend. Claudette said: “The weekend was very nerve-wracking, but I am glad I did it, as I wanted to test myself in something which I would be scared to do. “This is my first time pitching and I did freeze on stage twice, but I spoke with my heart and with help from the mentors I started to talk more confidently. The old me would have stayed at home and been too nervous to do this, but that is not how you start a career, so even though I did not win I still managed to push myself and my business. 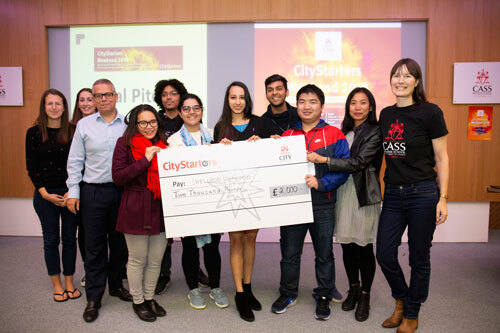 The next step in the entrepreneurial calendar is CitySpark, a business ideas competition open to all City students and recent alumni. Alexandros Tzortzevits, (BSc, Business Management).